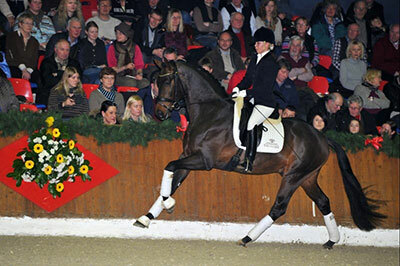 Follow Me, brown Oldenburg Stallion, by (Fuerstenball / Donnerschwee) born in 2010, standing approximately 16.2 hands. Follow Me was one of the colts at the 2012 Oldenburglicensing – a crop of exceptionally strong movers. He trotted his wayright to the very top rung of the ladder. With his beautiful type anddynamic, powerful, elastic and uphill gaits, he charmed his audience, literallypulling them out of their seats. 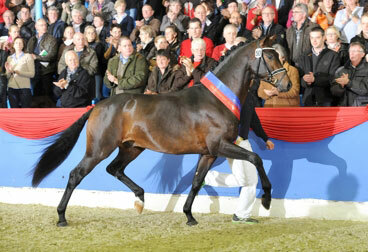 And best of all was his walk which was forwardmoving to the maximum in a clear four-beat sequence. Follow Mealso proved to be extremely rideable in his firsttests under saddle. Follow Me – from the tip of his ears to the soles ofhis feet a winner through and through! Thebloodlines in his pedigree, which has been refined three times by the Oldenburgdressage hero Donnerhall, leaved nothing to bedesired. 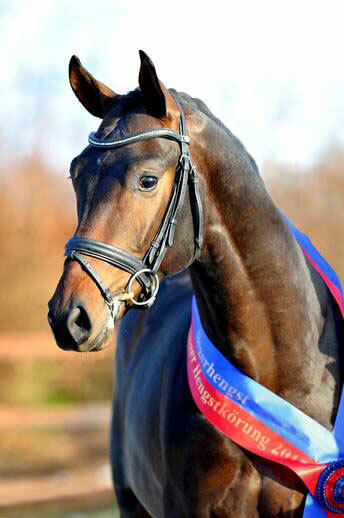 From Fürstenball‘s first crop, FollowMe set a price record at the auction, then became Champion Stallion, winner ofthe main premium and Bundeschampion. His dam,the Brillantring mare Cariana,is also the dam of another licensed stallion named San Piave (by Sunny-Boy) and three State Premiummares. 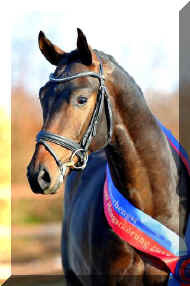 Donnerschwee, the dam’s sire, collected ribbonsin Grand Prix. Closely related through the line of Sakaza I-Centrumare the licensed Grand Prix stallions Donnerball/Kristina Sprehe and Ramoneur.